Men's uniform polo shirts to fit every budget are available in the sizes and styles you want at Sharper Uniforms. Our polo uniform shirts are specially designed to outlast ordinary department store polos. These men's polo shirts look professional, but are durable enough to survive multiple washings each week. Shop our affordably priced 100 percent cotton polo shirts for men, and our men's long-sleeve and short-sleeve polo shirts with pockets. We have wicking polo shirts with pockets that keep moisture at bay, and we have comfy cotton/poly blend polo shirt styles. Our extreme-protection reflective valet polo shirts have 1-inch reflective tape across the front and back to keep your staff safer after dark. Have all your polo work shirts embroidered with your logo or name at a low price, thanks to our in-house uniform customization service. We know that the guys on your staff like to be comfortable while they work, which is why they're fans of classic polo shirts. These collared shirts are available in a wide variety of colors and fabrics, so you'll be able to get the men's polo shirts that are right for you and your business. 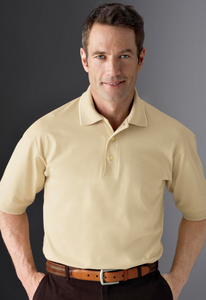 Our uniform polo shirts are available in 100 percent cotton, a cotton and polyester blend, or in 100 percent polyester. Also shop our men's uniform slacks and wait staff aprons to pair with uniform polos.